So the BF loves tacos…I mean all he wants to devour morning, noon and night is pizza and tacos. When he had to go out of town for a week-long business trip, I thought it would be nice to celebrate his coming home with…you guessed it..tacos! But I wanted the tacos to be a little unique. When I used to work in banking (a lifetime ago! ), I used to eat at Boloco’s in Boston’s Financial District quite frequently. I would order black bean burritos with mango salsa. 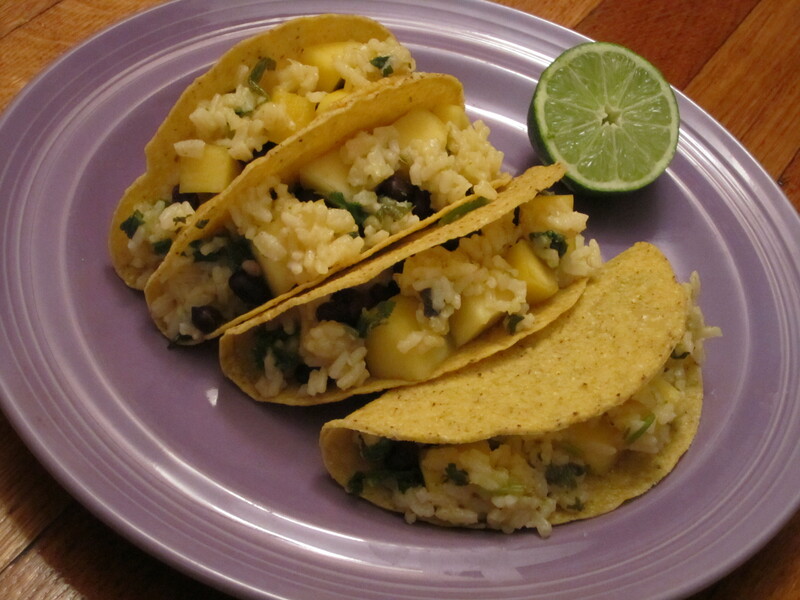 I loved the combination of hearty, slightly salty black beans with sweet, succulent mangoes. I thought it would be the perfect pairing here. But I didn’t want to overpower the two flavors. So I added Cilantro Lime Rice, a recipe from vegan goddess Terry Hope Romero‘s amazing Latin cookbook Viva Vegan! The rice steals the show here…simultaneously creamy yet delicate. The aromatic cilantro along with the fresh lime juice and lime zest, which you get from taking a lime and sliding the peel up and down on a grater, imparts the rice with a pungent zing. You don’t even need the typical taco accoutrements like salsa, taco sauce, sour cream or guacamole…the rice is that frakking good. I was practically inhaling it right out of the pan! This recipe is SO crazy easy and quick. You’ll have a meal in under 15 minutes. Plus, it’s light and refreshing, perfect for summer…or if you want to pretend it’s summer! 1. Preheat oven to 325 degrees F. Place taco shells on baking sheet. Warm in oven for about 5 minutes. 2. Scoop a small spoonful of rice in taco shell. Layer with a small amount of black beans, then mango pieces, followed by a final layer of rice. 1. Place rice, veggie broth, olive oil, lime juice and lime zest in a medium saucepan. 2. Bring to a boil. Then reduce to a simmer and cover with lid. Cook for approximately 5 minutes until thick and creamy. 3. Remove from heat. Add cilantro and scallions, fluffing with fork. Serve immediately. Tags: food, recipe, tacos, vegan. Bookmark the permalink. Previous post ← Roll Out the Red Carpet: It’s Time for The Feminist Oscars! That sounds awesome. I love anything with cilantro, lime, and mango. If I make it I will probably use brown rice instead of the white to make it healthier. I made this exact recipe, but i substituted a pound of ground beef for the rice, bean & mango’s.